Ascending Butterfly: Win a Got Milk? Themed Gift Basket! Chock of full of great stuff and Gift Cards (like American Express & Starbucks!) too! - 2 winners! Win a Got Milk? Themed Gift Basket! Chock of full of great stuff and Gift Cards (like American Express & Starbucks!) too! - 2 winners! If you are already following us on Pinterest I'm sure you have already seen that photo. Sometimes we post photos on Pinterest that don't make a blog post, so be sure to follow us there as well! The Breakfast Project, milkmustache.com, knows that every good day starts with Milk, and the campaign is running both in English and Spanish. In Spanish it's called El Proyecto Desayuno and can be found at bigotedeleche.com. Please stop over there right now and take a peek! Guess who the Blogger of the Month/Bloguera Del Mes is? That's right, it's ME! Ƹ̵̡Ӝ̵̨̄Ʒ - Keeping you slim! People who drink Milk regularly actually stay slim and enjoy the many natural vitamins and minerals that help keep you healthy and fit. I know people tend to think the contrary, but Milk as part of a healthy diet can keep you slim and fit! Ƹ̵̡Ӝ̵̨̄Ʒ - By drinking Milk regularly you can help prevent heartburn and other gastric problems. Drinking a glass of milk when you experience heartburn can calm your food pipe from inflammation. Ƹ̵̡Ӝ̵̨̄Ʒ - The calcium in Milk gives you strong bones, teeth, nails and helps your hair too! Ƹ̵̡Ӝ̵̨̄Ʒ - My Grandma swore by a hot glass of milk at night and she was right, it can soothe your nerves and help relax tense muscles which helps put you to sleep. Ƹ̵̡Ӝ̵̨̄Ʒ - Also helps to replenish the body and is good after a strenous workout! Milk provides nutrients that the body requires to function properly, vitamins (for our red blood cells), calcium (for strong bones), carbohydrates (for energy), magnesium (for muscles), phosphorous (for utilizing energy), potassium (for the nervous system), protein (growth and the healing process), riboflavin (healthy skin) and zinc (boosts immune system). Who knew that one simple glass of milk did so much? If you are not Lactose Intolerant, then you should make sure you are drinking at least one glass of milk per day, and adding it on at breakfast will help you start your day right! I have got to put on the tshirt so I can take a picture with it on! 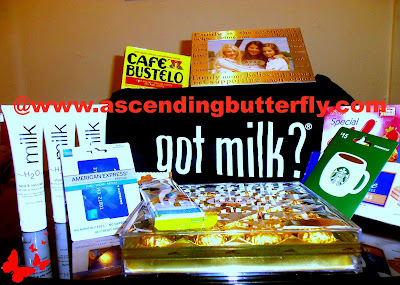 The basket contained Special K Cereal Bars, Ferrero Rocher Chocolates, Chocolate Straws, Sugar Wafers, a Got Milk? tshirt, Cafe Bustelo (which instantly reminded me of my Abeulita! ), A Picture Frame with motivational messages about the importance of family (why is it that I can never have too many picture frames? I love to display my photos! ), a pitcher, a Got Milk? Cup with straw, H2O Milk Skincare Products (I love all things H2O! In fact I'm currently using their Sea Salt line in my shower! ), and great gift cards including a $15 Starbucks Gift Card, and a $50 American Express Gift Card). Is Milk already a part of your Healthy Breakfast Butterflies? FTC Disclosure: This is a Sponsored Giveaway by Proyecto Desayuno, All Opinions are 100% my own. Visit our Giveaway and Disclosure Policy HERE. I do feel that Milk is a very important part of a healthy breakfast and is very much a part of my personal morning routine! Milk is already part of my breakfast by having it my cereal. I like milk with my cereal most mornings. My daughter and I have had lactose intolerant issues in the past, but we both drink milk fine now. It is a staple in our house. I always start the day with my cereal and milk but my favorite is a cold glass of milk and Mallowmars cookies yum! I enjoy milk in my cereal. I love milk ANYTIME but I have a glass of Ovaltine and milk every morning! Yes, Milk is already a part of my healthy breakfast routine. I love it with my cereal, my hot chocolate and my Cafe con Leche! Have milk with my cereal most every morning. 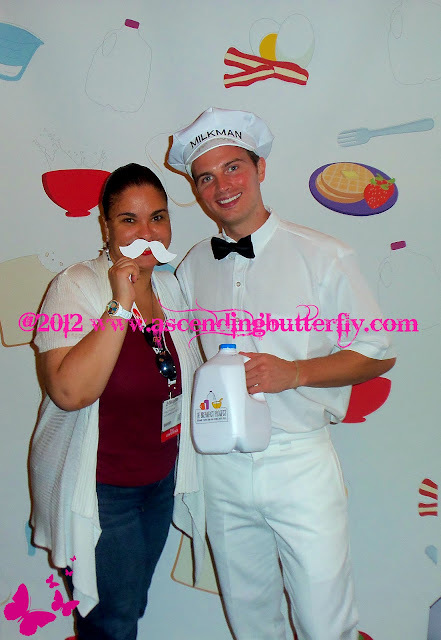 The whole family enjoyed the milk during breakfast or dinner with cereal, oatmeal, waffles or one we love to drink milk! I drink milk for breakfast and sometimes as a snack in the evening. Yes, milk is already a part of my healthy breakfast routine. I enjoy it in cereal and drinking chocolate milk every morning while working on giveaways. I use 2% milk on my Special K cereal every morning, and my kids fill their sugary cereal bowls with milk, too! I usually have a bowl of cereal in the morning.. then after I work out I put milk in my protein shakes. I usually drink milk at night, not in the morning. I love to drink milk with chocolate! Yes, milk is party of my breakfast routine and I have it every morning with my cereal or bagels. Milk and cereal, cereal and milk! I lovvvveeee milk in my cereal, and I love to drink it with strawberry hersheys syrup in it!! Milk is a huge part of my breakfast routine! I eat cereal practically every day and always drink the milk afterwards. I do not drink milk because I do not like the taste of it. According to my mother I would not even drink it as a toddler. I eat a lot of yogurt, though. I love milk and it's not just for breakfast. I still love a cold glass of milk with most desserts and I love cold milk with my cereal anytime of day. I consume at least 1/2 gallon of milk a week. I use milk in my coffee in the morning & have it in my cereal if I decide on cereal for breakfast. I love milk anytime especially strawberry or chocolate milk with breakfast or white milk in my cereal which I try to eat 3 times a week :) I wish I could get my 18 year old son to drink it more .. he likes it but would rather drink kool-aid, juice, or pop! We drink milk almost every morning whether it is with cereal or with a poptart etc. I like to have yogurt for breakfast. I love milk. I have it in my cereal in the morning and also in my morning coffee.